Clean and shine your paint with ease! The CarPro EcH2o Concentrated Waterless Wash will allow you to safely and easily clean your paint without using any water! EcH2o is packed with high end SiO2 hybrid particles and features an eco-friendly organic lubricant formula. What CarPro calls "lifting agents" combined with natural organic extracts and lubricants, allow you to encapsulate light contamination on the surface, safely lifting it off your paintwork with ease. Now, I know what you are saying, this sounds just like any other quick dertailer or waterless wash on the market, wrong! Not only will it clean the surface, but it will leave behind an amazing level of gloss. The secret in the gloss comes from that aforementioned SiO2. The finish left by EcH2o mimics the incredible properties that have become synonymous with the CarPro SiO2 sealants and CQuartz coatings throughout the years. The gloss that is left behind will have you extremely happy and wondering what you ever did without this product in your detailing arsenal before! Another awesome benefit of this product is that it is concentrated and you can dilute it to different levels to meet your needs for any job. Take a look at the suggested dilution ratios directly from CarPro below. Clean and shine your paint today with the CarPro EcH2o Concentrated Waterless Wash! 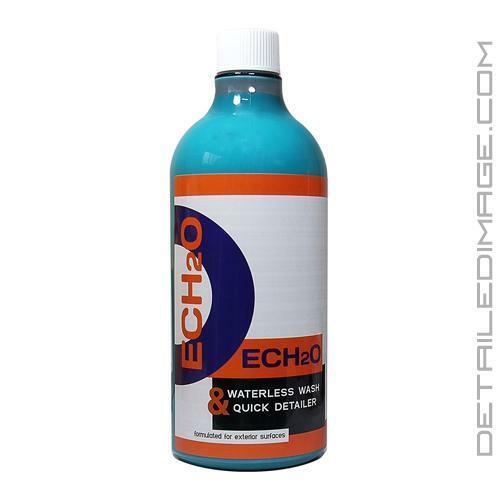 So if you're new to waterless washing, or just looking for a versatile product to help keep your car clean, I'd recommend giving CarPro EcH2O a shot. High Gloss SiO2 Hybrid Detailer. Works great in sun and shade. Dilute ECH2O 1:10 ~ 1:15 (ECH2O: Water). Spray ECH2O liberally and thoroughly across one entire panel. Lightly wipe with BOA microfiber towel across surface, flipping towel to fresh sides often. Spray product across surface once more. Using a fresh BOA towel wipe once more, this time removing all remaining dirt. Move to next panel & repeat steps 2-5. Continue around vehicle. With a fresh clean towel, complete a final light wipe of vehicle. Such a versatile product. Works great as a waterless wash, detail spray and rinseless wash. It works great at 1:20 for a detail spray and drying aid. Leaves a nice slick and glossy surface. It works great with other coatings besides CarPro. I got my product a couple of days ago. I use it for the first time on a customer car. This product is amazing. Remove dirt and bugs with no problems. It brings the shine out on the car as well. My customer love it. Mix 1oz with 1oz Carpro reload and 10oz distilled water makes the most awesome detail spray ever and last months, absolutely recommended.